K_tigress's Creative log: Flamingo Tee shirt. Ok so I purchase this cheep tee cause I need a tee for mostly when its cold outside. For when its cold out side? Well ya, I like to wear a tee as an extra layer under my shirt when its winter. You know, layers? 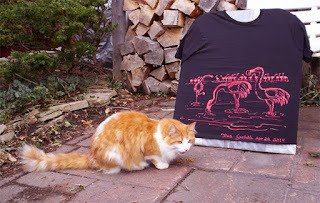 But then I'll also probably wear it on a nice day too. You know, hot and sunny? So anyways, you know me, when I see a potential blank canvas, and well to me this is a blank canvas, I just had to paint something. 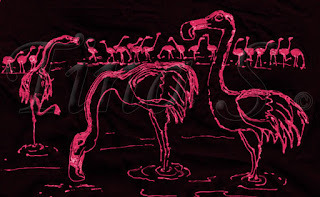 I decided to paint some flamingos on it. Reason, just felt like it. Just haven't gone to Florida in years and well flamingos pretty much fit the bill. Laughing gulls being more of favorite symbol of Florida to me second only to palm trees, white sand and warm weather. 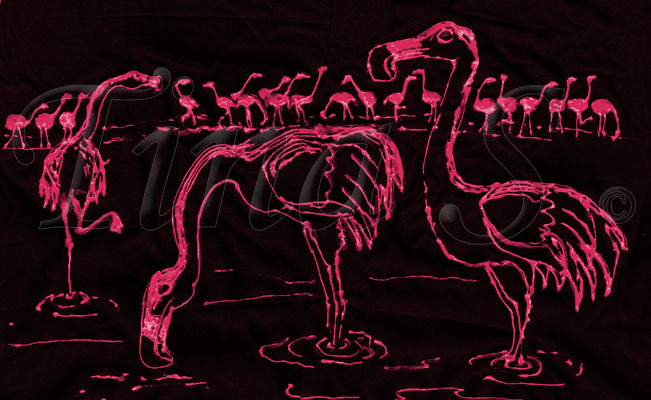 But somehow flamingos just seem to fit this tee. I decided just to freehand it instead of just putting some kind of guiding lines all over it and just went at it. 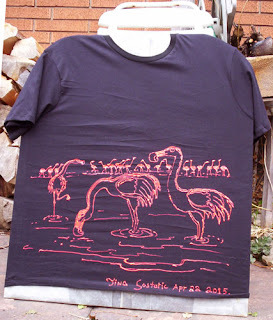 Using just pink acrylic fabric paint and memories of the birds applied the paint in a sketchy scribbly style. I went over some spots with more pink paint doubling the line thickness to produce the elision of highlights. I tried to take advantage of the black tee and the look of the paint as best as I could. Could have finished it in one day but the paint was kind of old and had some difficulty getting it to flow out of the bottle. So instead of getting frustrated, I just took a few days to finish it, letting some of it to dry while working on another spot. Eventually after completing it, I heat set it in the dryer. I think I achieved what I wanted and even got a bit of therapy out of it. Not totally realistic but you pretty much get what the point was. Available for viewing at my web site soon.